Thinking of another Talon.... ? GWTW Forum > Kites! Kites! Kites! 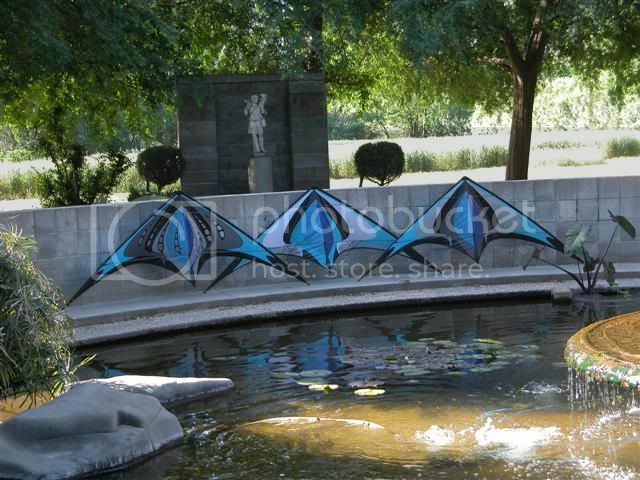 > Sport Kites > Thinking of another Talon.... ? I might, just might, be so unbelieveable lucky, that I have opportunity to buy a new kite soon. I have the Talon UL, and I am extremely satisfied with it. It gives me great joy, it really does. Now, there is a lot of very appealing kites on the market, but I really like my Talon UL, so why not go for another. Not UL, offcourse. I fly the UL as much as I can, but feel that it is at it´s best, below 8mph. I fly it even when it picks up, but when it gets above 12mph, it simply is not as much fun. Then it´s a good thing, that there are two more Talons, in Marks line-up. The vented and the standard. But if the opportunity arrises, which one to get ? I read a lot of good things about them both. The vented should be a fun flyer, even in low winds (for a vented kite that is), and is rated up to 30mph. That should keep me covered, seriously doubt that I would ever go flying in 30+mph. Would a set of UL and vented, leave a big wind-strenght gap where neither of them is really fun to fly ? Would I be better of getting a STD ? Also in this equation is the fact, that I soon will recieve another very nice kite (MB Customs Webbed Synthesis), in the STD windrange. It´s not a Talon, but have heard good stuff about it. And it is real prrrreeeettyyyy..... Not Talon-pretty, but equally pretty, just in another way. Yes, I am not oblivious to how a kite looks. I mean, hey, I chose a Talon for my first really expensive kite. Re: Thinking of another Talon.... ? I would suggest you get the std. Talon first. Its a lot more like the UL than the vented is. Eventually you'll end up with all 3 but you'll probably fly the std. & UL a lot more often than the vent. At least I do. But the vented is the prettiest. It's always the pretty ones that cause the most trouble. You can always follow Marks suggestion: Talon Std 1st, then the UL and then the Vented. I happen to have all three and I find that I have the most hours on the UL then (just slightly less) the STD, and finally the Vented. The two work horses are the UL and the STD with the vented used infrequently. By your reasoning, you feel the the Talon UL begin work right for you at 8 mph. The STD will probable start working for you at 14 or 15 mph, leaving the Vented at over 20 mph. If you get the vented first, you are going (my your standards) to have a very big wind speed hole between the UL and the vented. A STD kite is just that, the Standard kite. With the UL being used for lighter winds and the Vented used for higher winds. The only reason I can see for not having a STD kite, is you don't have the std speed winds (it is either nothing or a lot) where you normally fly. Or you already have a good std kite to fly in those winds. Then you question is answered. Get a Vented for high winds. Hill :-? :-? What hill? I don't remember any HILL!! :-? :-? For what i have heard about the Talons, i will go for the standard . That beauty is next on my wish list .